I’m learning already that a great deal of an aspiring professional actor’s time is spent waiting. Waiting to get an audition time, waiting to hear about callbacks, or casting. Lots, and lots of waiting. I’m of two minds about this. Generally I have been good at the old “set it and forget it” mentality – the audition or submission is done and out of your hands, and no amount of energy you spend worrying about it will change the outcome, which is already in motion. However, that was a lot easier to say inside of the cozy womb of theatre school, during which time one is always somehow ‘busy’. Remove constant stimulus and long hours spent in sweatpants, and one might find themselves with a little more time on ones hands. More time to obsess, catastrophize, or build up hopes that may or may not be dashed. And so, dear readers, I put forth a list of things that I and my fellow novice actors have done to fill the void, and to avoid circular logic and entirely wearing out one’s roommate with constant speculation on the state of one’s artistic career. I’ve developed this ‘theory’ regarding auditions – when faced with the stress of the audition room, the body tends to react from a place of animal fear, the place that tells you that you are being chased or hunted, and are in imminent danger of being eaten. If I were to, say, eat some sort of fatty food after every audition, could I rewire those neurons to see auditions as the precursor to a tasty snack? Would those animal fears give way to delicious anticipation? 3 weeks after grad. So much face-obscuring fringe. During our 3 years of guidance and repeated requests from our instructors to ‘get your hair out of your face’, the ladies of BFA Acting 2011 at UBC obediently trimmed, clipped, pinned and hairsprayed our locks into submission. 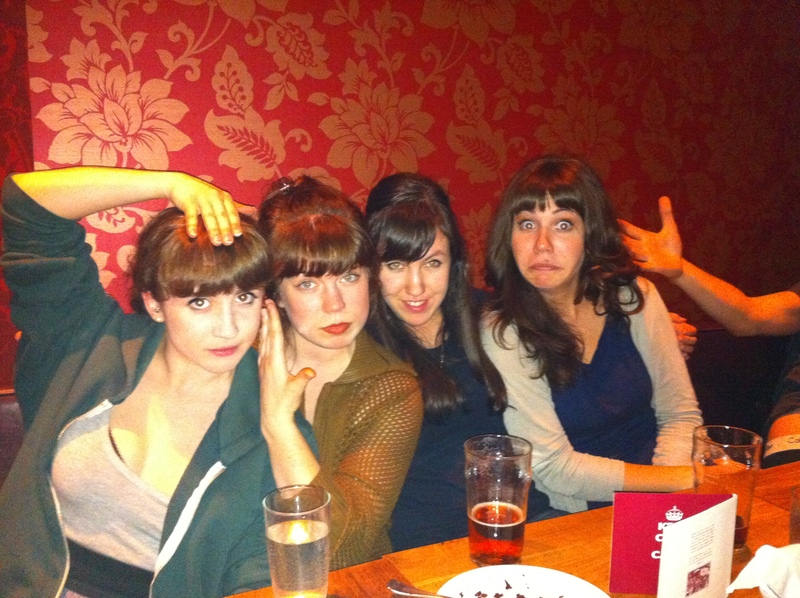 The minute we graduated, we all went out and got bangs. Eyeball-poking, eyebrow-grazing, face-obscuring bangs. Sorry, Stephen. One of my favorite parts of post-school life is all of the non-theatre related reading I’ve gotten to do. Right now I am reading The Year of the Flood by Margaret Atwood (just a good old, dystopian beach read). I am currently spreading the gospel of Goodreads, which I describe as Facebook for books. Join up, add me as a friend, and let’s share our favorite reads! Books are awesome! As much as I joke about the anxiety of post-school life, it has been immensely comforting to be welcomed into the vibrant and friendly community of young actors that work in this city. I met so many fantastic folks doing Bridge Mix, and continue to be inspired by projects like The Verona Project, bash, and Party This Weekend – young artists going out there and making the kind of work they want to be part of, and gathering on the resources of the independent theatre scene to do it. I can see already how discouraging this business can be, and how easy it would be to develop a chip on ones shoulder, but here is a generation of positive, empowered young artists who do incredible work and have a great time doing it. I’ve met so many wonderful people who I am so excited for and by, and I look forward to spending more time in their company. This is the generation that doesn’t want to wait for permission to make the kind of theatre they believe in. They remind me that if you want to be an artist, you don’t have to wait. You just have to go. This entry was posted in Anxiety, Future, Practice and tagged acting, anxiety, auditions, theatre. Bookmark the permalink.